Standard cribs, despite their name, are often anything but ordinary. They range from classic beauty to gorgeous elegance, from around $100 to well over $1000 and because they come in so many colors and finishes you are sure to find one that is perfect for your baby nursery. Available in a large variety of finishes, including white, cherry, oak and black. Included in most of the leading brand product lines. Click here for over 90 Sleigh crib models ranging in price from $140 to over $1000. Available in a large variety of finishes, including white, cherry, oak, black and natural. Manufactured by Da Vinci, Angel Line and Delta. 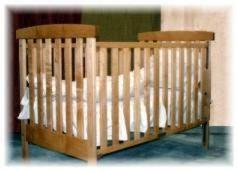 Click here for over 140 Traditional crib models ranging in price from $100 to over $1500. Available mainly in white with dark or brightly colored panels or ebony. Manufactured by Da Vinci, Nurseryworks, Stokke, Argington, Oeuf, Bratt Decor and more. Note that some standard cribs have a one-hand release mechanism - this is obviously what you would be looking for, since baby would be in your arms. Any drop mechanism that requires two hands is more hassle than help. Also note that one drop-side rather than two, results in a more stable crib. Drop-down rails on one or both sides of the crib, allowing easy access, you can even change or dress your baby in the crib. An adjustable mattress support - Allowing you to lower the bed as your baby grows (and grows!) Check for strong, preferably metal support. A metal spring support system is best. When baby starts jumping, you don't want any falls. Drawers underneath the crib - Allowing for extra, much needed storage space. You can never have too much storage space! Click here to read more about nursery storage solutions. Teething rails - Prevent baby's mouth from getting full of splinters when those first precious teeth start pushing through. Rolling casters - Allowing you to move your sleeping baby to a convenient place for you to watch him or her. This can be an enormous stress-reliever for a new Mom. Check for locks on at least two of the casters to prevent unwanted rolling. Standard cribs are available with an organic crib option. So far I have found five different styles to choose from including a convertible canopy version. Because standard cribs are sized for standard mattresses and bedding you can use organic crib mattresses and bedding too. Synthetic mattresses have been associated with an increased SIDS risk. Over 90% of new bedroom furniture is made using medium density fiberboard (MDF)? This material outgases toxic chemicals such as formaldehyde for years. When you put your baby in a crib that is made of MDF or is coated in a non-organic finish you are putting him or her into a chemical factory. Many baby crib manufacturers claim their cribs are made of natural wood; however, they often have drawers or other parts that are made of particleboard or veneers that can cause out gassing of chemicals. Some also claim that their cribs have a non-toxic finish when they really allow polyurethane coatings, varnishes and stains that may be harmful to your baby over time. Consider buying an Organic crib to keep your precious one safe from harmful chemicals. Are among the least expensive. You can find a really pretty crib for under $250. Sometimes a simple, down-to-earth baby crib can be more elegant than the most expensive, elaborate model. 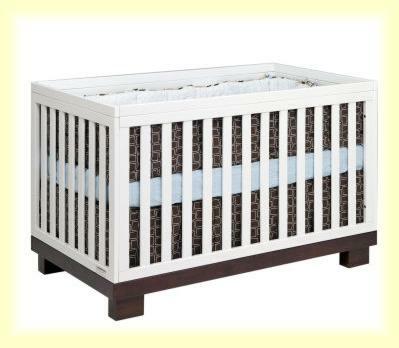 Click here for over 30 standard baby cribs priced at under $200. 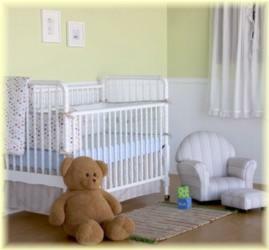 Or see our discount baby cribs page for more inexpensive crib ideas. Are readily available, either from your local outlet store, or online if you prefer a wider selection. Use standard crib mattresses and standard crib bedding. Again - these are readily available, in a wide variety, at your local outlet or online, with an organic option. Come with a convertible option in many cases, making them a great investment for years to come. Use standard crib bedding, which is available in abundance. Choose almost any nursery theme or color scheme and you will find a number of bedding options to match. Are often offered with coordinating baby changing tables, armoires and dressers.